How to Dress and Freshen a Slow-Cutting Diamond Blade | Desert Diamond Industries – Your Safety… Our Priority! Is your diamond blade cutting slow? Has it stopped cutting altogether? This thread over at the Lapidary / Gemstone Community Forum may be just what you need! It has plenty of tips and tricks on how to dress and freshen diamond blades. It’s a little scattershot (as forum discussions tend to be), but we think that it’ll give you exactly the diamond blade dressing technique that you need. Or you can just use diamond blades that don’t need dressing or freshening and that keep cutting at the same speed until they’re worn out, like the Ductile Iron Safety Blade and Fire Rescue Safety Blade. Just throwing that out there. Remember, we’ll be at the FDIC 2013 firefighter conference in Indianapolis, IN from April 25 to 27! Visit us in Booth 9550 at the Lucas Oil Stadium. See our press release for details. 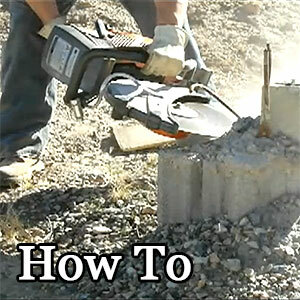 This entry was posted in How To and tagged Construction, Diamond Blades, How To, Stone, Water on March 25, 2013 by Desert Diamond Industries.